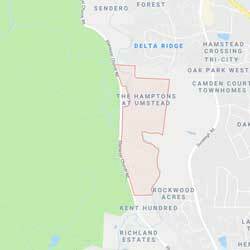 The Hamptons at Umstead is located in Raleigh, NC. The community is close to the Triangle Greenway, RDU Airport, great shopping and restaurants. Homes in this neighborhood were built by some of Raleigh’s premiere builders with beautiful landscaping and quiet streets. The Hamptons at Umstead offer luxury homes with gourmet kitchens, game rooms, screened porches, large patios and some include private pools and basements. Square Footage ranges from 3,600-over 5,000sq ft.